We often get calls about the break-in procedure of a newly-rebuilt engine. Proper break-in is critical and sometimes overlooked. Even though you may have used one of our outstanding overhaul kits and your mechanic did a great job installing the parts, if the engine is not broken-in correctly, the rings may not seat, leading to oil consumption and power loss. Check out our video covering everything you need to know about diesel engine break-in. We'll talk about what diesel engine break-in is, how to break-in your diesel engine, and who is responsible for proper engine break-in. Why Break-In a Diesel Engine? Proper diesel engine break-in is crucial because it controls your oil consumption, fuel economy, and engine power. Many expect improvements in these three things after rebuilding engine, however if the proper break-in procedure isn't followed, oil consumption, fuel economy, and engine power could be worse than before engine rebuild. What is Diesel Engine Break-In? Diesel Engine Break-In is the process of seating the rings to the liner. Piston rings are designed to apply a small amount of outward force, but they rely heavily on the combustion pressure to force them down against the bottom of the ring land and outward into the cylinder wall. Without these forces, the rings will not seat or seal properly. 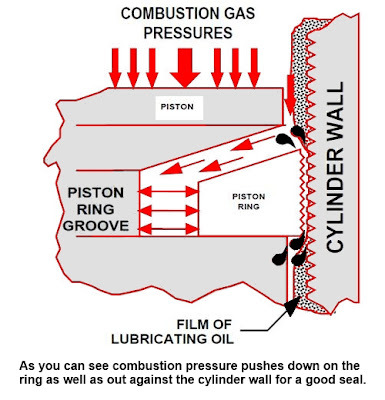 Oil control rings will regulate the amount of oil film left on the cylinder wall to lubricate the compression and piston. In turn, these rings also remove some of the oil film, resulting in proper oil control. Every manufacturer's manual provides directions on the proper way to break-in your engine. Always refer to the manufacturer's manual prior to doing any work on your engine. Running your truck on a dynamometer is the best way to ensure proper load and temperature is maintained; however, more often than not, a dynamometer is not an option. In that case, idle time should be limited to less than 10 minutes for checking for leaks and proper oil pressure. High RPM light load operation must be avoided during the run in procedure. Operate the truck pulling the heaviest available trailer allowed for the first 100-150 miles. Operate the truck in the highest available gear within the operating RPM range at 75%-80% of rated horsepower. Procedures vary from rebuilder to rebuilder and you may already have a proven process for engine break in. The one thing that seems to be a common theme is to keep the initial startup, oil pressure and leak checks to the shortest amount of time possible. Then immediately loading the engine will be vital to its health and longevity. Delaying the loading process can result in oil consumption. Who is Responsible for Proper Engine Break-In? It is the responsibility of both the repair shop and the customer to break-in a diesel engine. To put it simply, without clear lines of communication and teamwork, proper engine break-in is extremely difficult to complete. Before the repair is initiated, discuss how the engine will be broken-in. Whether you and your shop decide to use a dyno or you bring a load with the engine, discussing how the engine will be broken-in prior to repair is the fastest way to a successful diesel engine rebuild.